We all know that eating healthy is very important, but what having a healthy home and environment? Are there things you do to help keep you, your family, your pets and environment safe? One simple thing you can do is make the switch to eco-friendly, green products like those from Ology! Thanks to our friends at Moms Meet we got to review 3 amazing products from Ology. 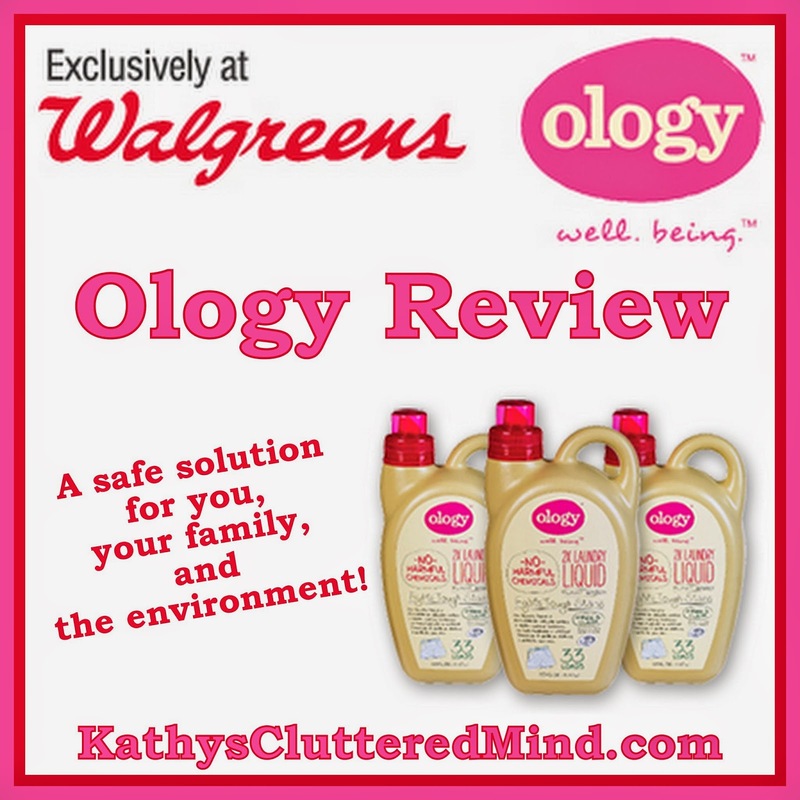 Ology is a Walgreens exclusive brand and makes household cleaners as well as paper, personal care, and baby products. We got to try out the Ology Laundry Liquid Detergent, Paper Towels and All-Purpose Cleaner. All of the Ology products are designed to give you peace of mind. They contain no harmful chemicals and are 100% tree-free! That means that their products are safer for you, your family, your pets, and the environment! Ology avoids toxic chemicals, and uses sustainable raw materials and nature ingredients during their production process. Detergent is a sensitive area for our family, literally! All 4 of us have sensitive skin and will either break out or get itchy when we use many of the detergents, soaps, cleaning products, lotions, make ups and even sun tan lotions on the market. I first used the free and clear scent Ology 2x Laundry Liquid Detergent on my children's clothes, yes I totally used them as guinea pigs. Not only did the detergent get out the tough stains on their clothes, but neither of them broke out or got itchy. So I washed my clothes and my husbands next and neither of us broke out either. I was totally sold! Works in both HE and regular machines and is formulated to thoroughly clean all types of loads (regular, delicates, and woolens). Available in a free and clear scent as well as a spring lavender vanilla scent, both of which are derived using only natural ingredients—nothing artificial. Contains no dyes, artificial fragrances or phosphates. Contains no ammonia, chlorine bleach, DEA (diethanolamine), TEA (triethanolamine), parabens, phthalates, formaldehyde, nonylphenol ethoxylates, triclosan, and SLS/SLES. Made using plant-based and mineral-based raw materials. The bottle is made from 100% post-consumer materials. Never tested on animals and do not contain any animal byproducts. Endorsed by Healthy Child Healthy World, a national leading independent nonprofit organization, dedicated to the protection of children from harmful chemicals. Affordable retail price of just $6.79. I generally use inexpensive rags or old clothes and socks to clean with because they are more environmentally friendly and cheaper. They can be washed and reused many times before they have to be thrown away. But there are times that paper towels come in handy and they are certainly more sanitary when cleaning dirty bathrooms. Well now we have our solution to paper towels because Ology Paper Towels are 100% tree-free and they are whitened with H202, a non-chlorine based bleach. The paper towels are made from a readily renewable sugar cane husk which is quick-growing bamboo that regenerates in as little as 6 months. Plus they are ultra absorbent and biodegradable. The paper towels are available in a 2 pack for $3.99 and there are 65 two-ply sheets per roll and each sheet is 11 inches by 8.9 inches. This was my favorite product out of the 3!!! Why you ask well because it works amazingly well and the children can use it too! I generally use vinegar to clean with because it is inexpensive and safe for the children and pets, however it doesn't always get tough grease and grime cleaned. When our Ology package arrived the cleaner and paper towels were used immediately. You see it just so happened that we had family and friends coming into town for vacation and they were all staying with us. That meant the house needed a deep cleaning and my little ones were going to be in charge of scrubbing walls, baseboards and counters. I had nothing to worry about as I handed them the Ology All-Purpose Cleaner bottle because it is suitable for use on most household surfaces including kitchen counters and stove tops. And since the cleaner is free of harmful chemicals I didn't need to worry about them getting sick. Ology cleaner is plant-based and does not contain any harsh solvents, dyes, ammonia or artificial fragrances. And what's even better is that it works GREAT and cuts through grease and grime with one swipe, plus it smells great too (meyer lemon and lavender). My walls, counters and base boards never looked so good after being cleaned by a 8 and 7 year old! The Ology All-Purpose Cleaner retails for $3.99 per 26 fl oz bottle. Ology has won over our family and will hopefully win over yours. If you have been inspired to make positive changes in you home I encourage you to submit a pledge for a chance to win a $100 Walgreens Gift Card. 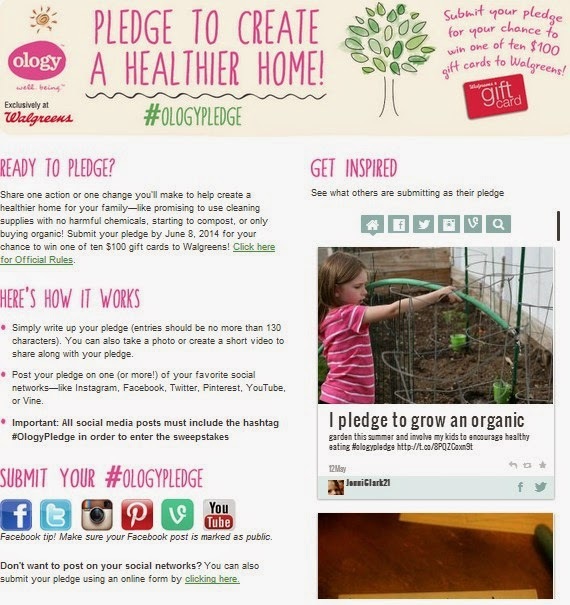 Simply visit the Ology Pledge Page on Green Moms Meet for details (or read below). Then make a pledge and share it on social media with hashtag #OlogyPledge (you can also include a photo or video). If you wish to submit your pledge privately visit this link.